RUSH ARCHIVE: Drive-By Media, just echoing whatever the Democrat talking points are of the day, or vice-versa. This is about Maliki. The Drive-Bys are going to try to topple Nuri al-Maliki. LEVIN: The Maliki government is nonfunctional. So I hope that the Iraqi assembly, when it reconvenes in a few weeks, will vote the Maliki government out of office. RUSH: That’s just unbelievable. Still trying to secure defeat in the midst of victory. Now, what’s interesting is, in the Washington Post today there’s a story by Jonathan Weisman, and they mention Democrat Representative Baird. We talked about him yesterday. He’s the head of the House Democrat steering committee. He’s in Nancy Pelosi’s leadership triumvirate. Last Friday, this is the guy that told a local newspaper in his district that he believes the US should stay in the country, in Iraq, as long as necessary to ensure stability. He said a lot of other Democrats are changing their views, too. ‘Rep. Jerry McNerney (D-Calif.) suggesting that his trip to Iraq made him more flexible in his search for a bipartisan accord on the future U.S. role in the conflict. ‘If anything, I’m more willing to work to find a way forward,’ he told reporters late last month. Rep. Tim Mahoney (D-Fla.), who was with McNerney, told his local paper that the troop increase ‘has really made a difference and really has gotten al-Qaeda on their heels.” Durbin basically said we’re making some measurable progress there. ‘But some Democrats have shifted their views. Baird said yesterday…’ and this is what’s interesting, ‘that Congress’s debate over the war has destabilized Iraq by sending wary Iraqi politicians back to their sectarian bases of support.’ This is profound, folks. This is a Democrat in Nancy Pelosi’s leadership triumvirate basically saying that the political situation in Iraq is bad because of the disagreement and the discord that has taken place in the debate in Congress. It’s destabilized Iraq. In other words, made ’em feel not confident that we’re in it for the long haul. So the political leaders are going back to their sectarian base, which means the Sunnis and the Shi’a, rather than unifying, they’re retreating and going back to their bases, or were. He lays it squarely on the debate going on in Congress, because that’s destabilizing because it’s not engendering any confidence. Now, I said earlier that one of the reasons this war has taken so long is because of the Drive-By Media in this country and the Democrats have done everything they can to invest in defeat and own it, and there’s a demoralization factor for the US troops. It may not be that strong, but I’ll tell you that it has, certainly over this length of time, encouraged the enemy. 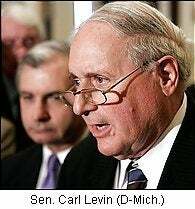 And now we find out that it’s destabilizing the Iraqi political situation that Carl Levin wants to solve by kicking Maliki out of office. That would really destabilize things. These guys are still angling for defeat, make no mistake about it.